If you are using Microsoft Visual Studio for development, you might want to change the color theme of the software to your liking. In this short tutorial I will show you where you can change the color theme in Microsoft Visual Studio. You can basically adjust every color on your own, but this tutorial will be more about the predefined themes and where to find them. The software comes with three very nice looking predefined color themes that are called Light, Blue, and Dark. As you can see in the screenshot above, you need to click on the “Tools” entry in the top menu first. In this drop-down menu, we will need to click on “Options”, that is the last entry in the menu. A new Options window pops up and by default we should already be in the “General” section, if not then find the “Environment” category and click on the “General” entry. Now on the right side, there should be a section called “Visual experience” where we see “Color theme” mentioned and a drop-down list where we can choose between the Light, Blue and Dark color theme. Try all of them out and pick your favorite theme! 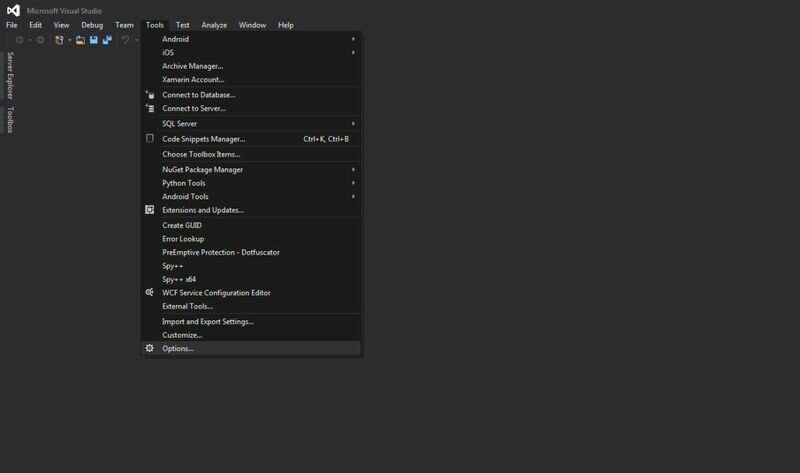 I hope this small guide helped you to find the menu in Microsoft Visual Studio where you can pick your favorite color theme. I know some people prefer a darker background, other people like a light background. Microsoft offers some nice predefined themes so that everyone should be happy. If you still want to adjust all fonts, dialog boxes and windows on your own, you might want to take a look at the “Fonts and Colors” entry in the “Environment” options category instead.